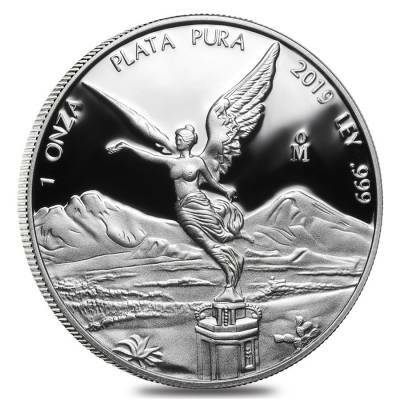 Bullion Exchanges is proud to bring you the newest installment to the Mexican Silver Libertad series, the 2019 1 oz Mexican Silver Libertad Coin in a proof finish. This coin comes in a mint-issued plastic cap which will protect it from the elements for years to come. Silver Libertads are minted at North America’s oldest mint, the Casa de Moneda de Mexico, which is highly regarded for the exceptional quality and finish in all their bullion coin products. These Silver Libertads are available in a range of other sizes that include 1/20 oz., 1/10 oz., ¼ oz., ½ oz., 1 oz., 2 oz., and 5 oz. sizes. With such a wide variety of sizes, it makes it very convenient for investors and collectors of all budget sizes to own Libertad silver coins. Libertads are popular in the numismatic world for their beautiful design and the purity of the silver content in them. 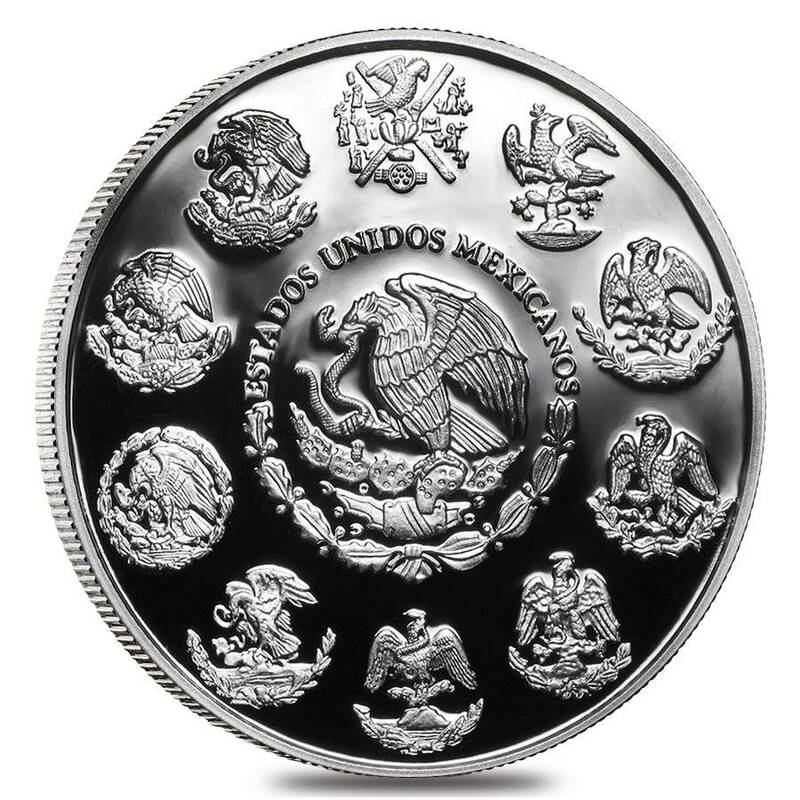 These coins are struck from .999 fine silver that has an obverse featuring a regal image of the Mexican Coat of Arms that have a golden eagle perched on a prickly pear cactus holding a snake in its beak and one talon. The image is inside a circular design, with the bottom half depicting an olive and oak wreath and the top half inscribing "Estados Unidos Mexicanos." The reverse displays an image of the Angel of Independence which honors the statue perched upon a victory column in downtown Mexico City. Victory holds a laurel wreath in her outstretched right hand, signifying victory and in her left hand, she holds the broken chain depicting freedom. The image is centered around a beautiful backdrop of the Mexican landscape featuring its two most iconic volcanoes, Popocatepetl and Iztaccihuatl. Obverse: Features the current Mexican Coat of Arms - an eagle sitting atop a cactus with a serpent in its beak and talons. The design is encircled by the inscription of "ESTADOS UNIDOS MEXICANOS" on the top half and bottom half by a laurel and oak wreath. In addition, is the different national coats of arms used throughout the country's history. 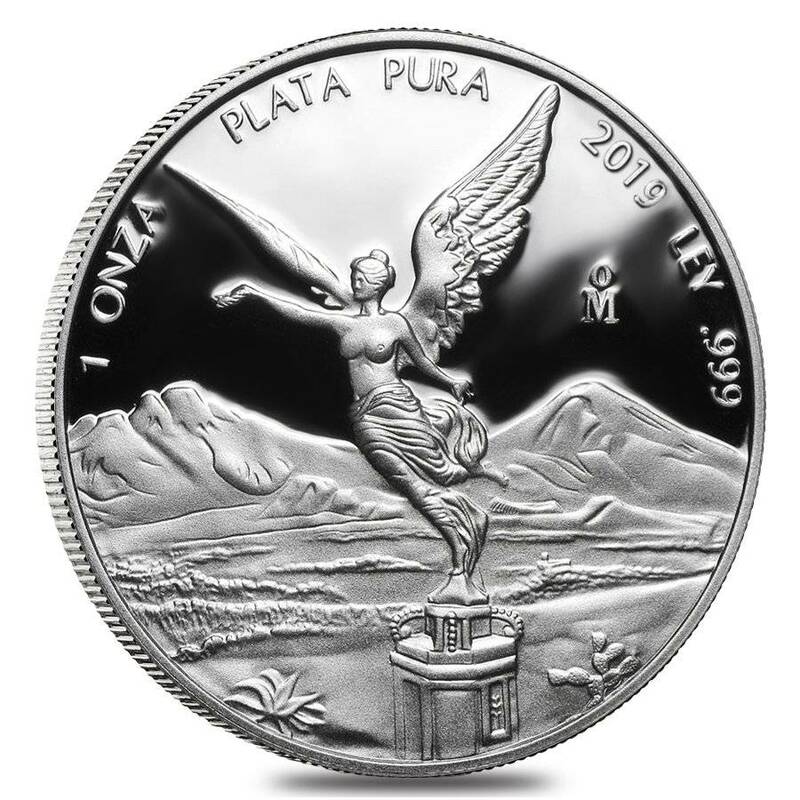 Reverse: Displays the Angel of Independence holding a laurel crown and broken chains in her hands on a backdrop of a Mexican landscape containing its two famous volcanoes, Popocatepetl and Iztaccihuatl. Engravings include the weight, purity, metal content, and year of mintage. Bullion Exchanges offers you a great selection of exclusive items from renowned international refineries. Add this Proof Silver Libertad to your collection today and it will be carefully wrapped, packaged, and delivered to your address. If you have any questions send us a message using our convenient web chat or email us at customerservice@bullionexchnages.com and our customer service representatives will be happy to assist you. Item is newly available and ready to ship! With this purchase, you earn 43 Bullionaire Bucks 43 BB = $0.04. We currently have 9 of this item in stock. For every $1 spend, you will earn 1 Bullionaire Buck which is equivalent to $0.001 off a future purchase. 43 BB = $0.04.